It only appears Hoboken's 2012 election will never end as the Hudson County Board of Elections tallies the various ballots uniquely deployed in this election cycle following Hurricane Sandy. It's anticipated that ballot count for the various types of votes will be available tomorrow at some point but the final numbers are not likely before Thanksgiving confirmed just earlier. For those curious about what Hoboken is looking at in this election, MSV can at least offer this interim insight. Provisional ballots are unusually high being this was a Presidential year and there was redistricting adding to voter and poll worker confusion. The Vote-by-Mail ballots returned are in the range of 1800 and provisionals are believed in the same ballpark. On the new email/fax voting option instituted by Governor Christie due to Hurricane Sandy, Hoboken saw approximately 300 processed. 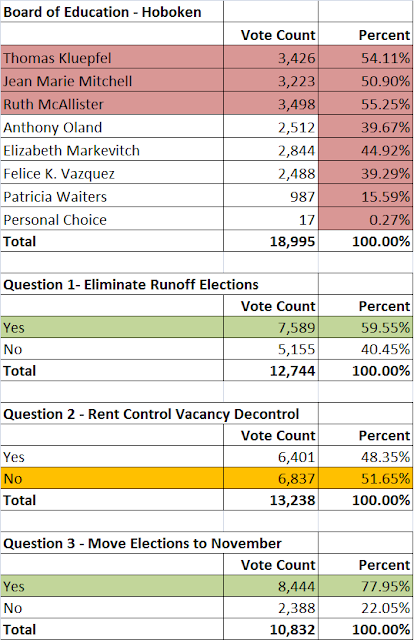 On the BoE, the three seats up in the election show all three Kids First Candidate in the lead on the machine votes with about 400 separating Jean Marie Mitchell and Liz Markovitch in third and fourth place. 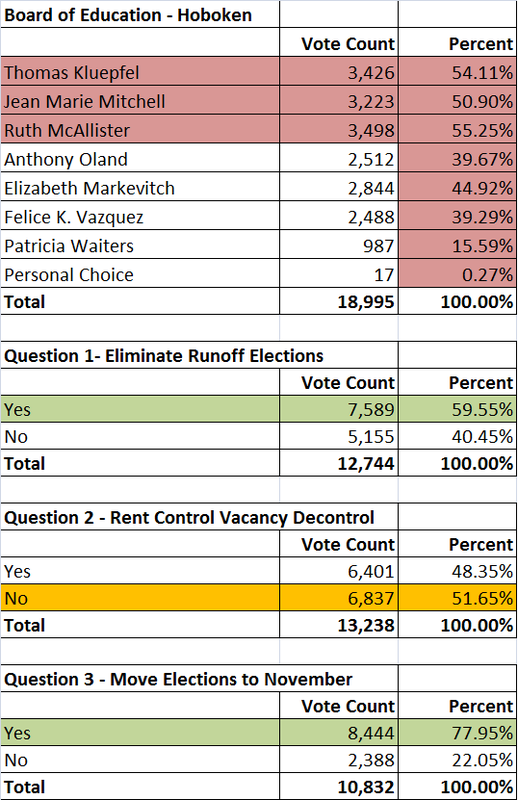 The other relatively close Hoboken election issue is the rent control question where the advocates for rent control hold a lead of 531 votes (slightly more than the chart below).